Figure 1. 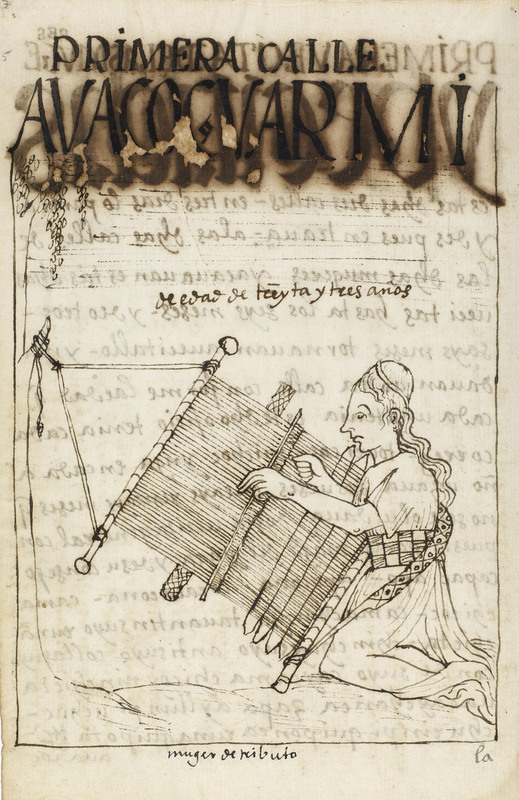 A 16th century drawing by Felipe Guaman Poma de Ayala shows an Inka woman working on a backstrap loom, the type that was used since pre-Inka times and continues to be to this day. Image courtesy of The Royal Library, Copenhagen. The claim that “tradition is not the worship of ashes, but the passing on of the flame” has been attributed to Gustav Mahler (Tuzi 2015, 47). It aptly conveys how a tradition is ongoing, how people pass on a certain “flame” — the Olympic torch comes to mind — to the next person or generation. Looking at it another way, it reminds us that the character, vibrancy, and worldview of a place, a culture, a nation, or a set of allied groups cannot readily be extinguished. “Worship of the ashes” connotes, in contrast, a dead fire that later peoples cannot revive; it signals a past that is gone, a complete discontinuity, and a pointless backward-looking exercise. Obviously, all cultures have some living and some dead parts, otherwise there is no change, no way to leave certain paths behind and explore others. Yet even as people move on from earlier ways, their approach usually remains tied in some ways to that which has gone before them. In figure 1, an Inka woman is shown weaving on the same kind of backstrap loom that both her distant ancestors and her contemporary descendants routinely use to make cloth (see Capturing the Rainbow). In the Americas, certainly the Europeans attempted over the past five hundred years to smother the “fire” of the indigenous peoples. This exhibition and catalogue explore the living relationship, the continuity, between past and present in three areas: among the ancient and the modern Andean cultures (see The Best of the Best, Dialogues in Thread, and Capturing the Rainbow by Shelley A. Burian); the modern Guna of what is now northern Panamá and the San Blas Islands (see Engaging the New); and the modern Maya of present-day Guatemala (see Creations of the Red Goddess and Dressing the Saints by Elizabeth Caris). 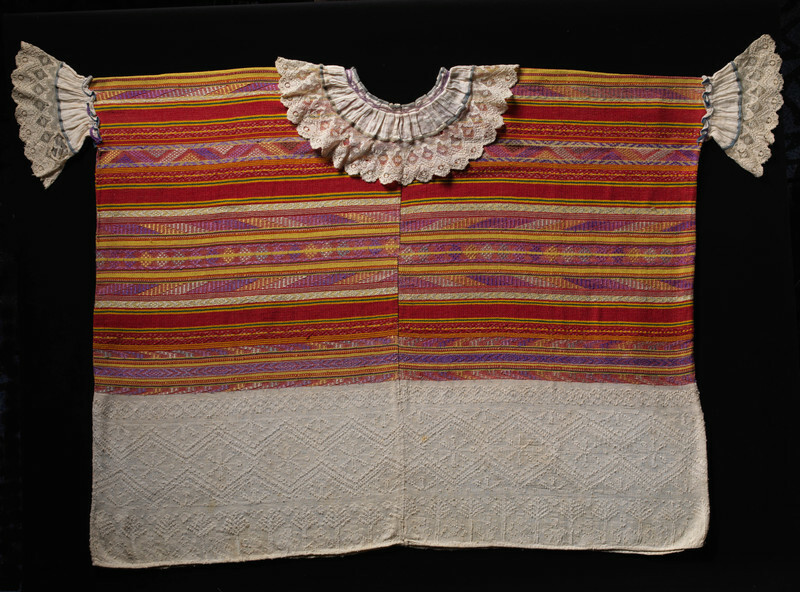 An essay by guest author Dr. Dorie Reents-Budet (see The Ties that Bind) fills in our knowledge of garments and cloth among the ancient Maya, from whom only a handful of actual textiles remain. Figure 2. 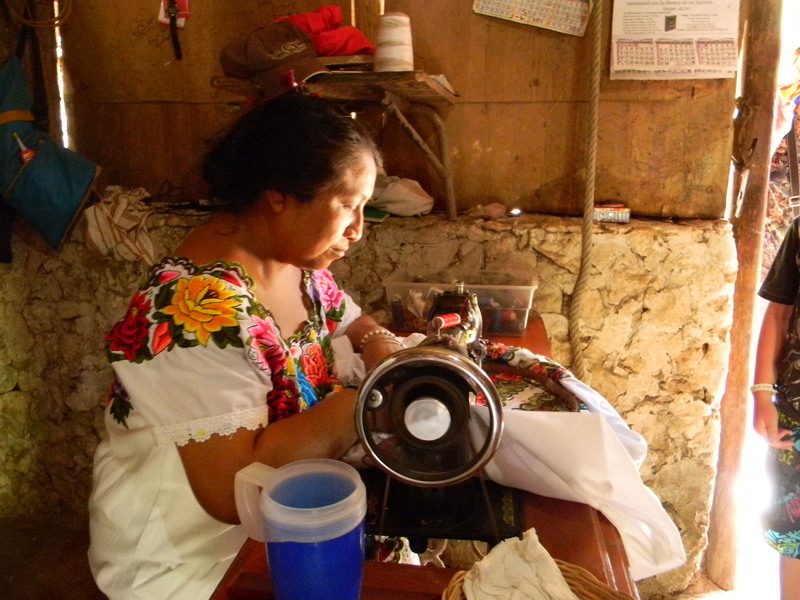 A contemporary Maya woman may use a sewing machine and drink from a plastic mug as she works. Photo by Laslovarga, licensed under CC BY-SA 3.0. From the outset, it is important to note that at least 90% of weavers in the indigenous Americas are, and seemingly always have been, women. Men were the second-best weavers among the Inka. A few work the backstrap loom today and many Andean and Maya men use the treadle loom introduced by the Europeans; however, the vast majority of weavers were and are female. A Maya woman wears a rectangular blouse called a huipíl, versions of which are found on ancient Maya carved scenes (see The Ties that Bind). Yet the proportions were shorter and wider that ancient versions and the blouse is now tucked into a skirt rather than worn over it as in the ancient depictions (see Creations of the Red Goddess). The skirt may be a wrap-around, the indigenous form, or a gathered Spanish-influenced one with an apron over it. She may also sew on an electric sewing machine (fig. 2) and wear plastic sandals and a fringed polyester shawl imported from China. Thus, this “traditional” woman is a veritable palimpsest (a series of layers through time). Figure 3. 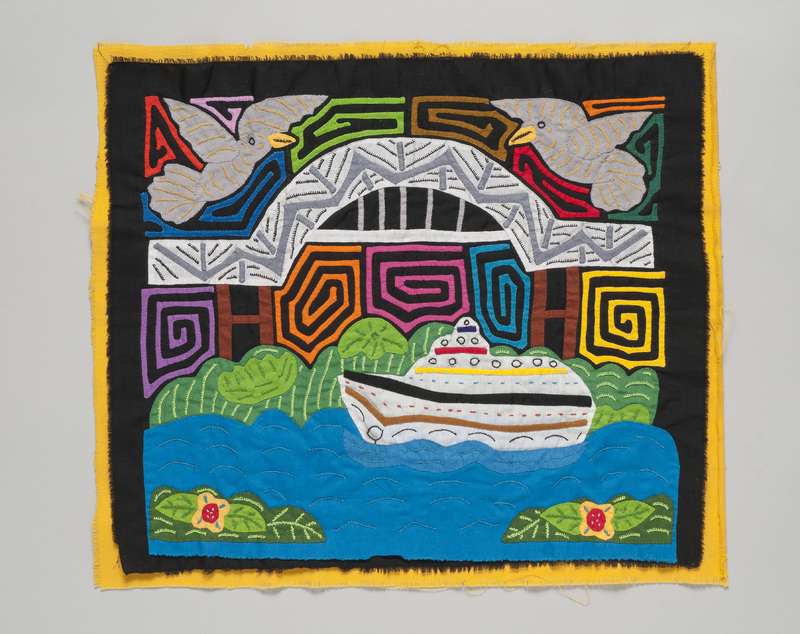 A dulemola (blouse panel) by contemporary Guna artist Malvita combines the Bridge of the Americas and a boat on the Panama Canal with tropical birds, flowers, and a sky filled with ancient spiral symbols of the cosmos. On loan to the Michael C. Carlos Museum, L2016.10.3. Photo by Michael McKelvey, 2017. Likewise, a Guna woman may make a dulemola (cutwork blouse panel) into which she cuts elaborate spiral patterns that refer to ancient cosmological beliefs to fill the sky around an image of a ship in the Panama Canal (fig. 3). If she is older, she may still have a blue stripe painted down her nose and wear gold jewelry (ancient practices), but also leg- and arm-wraps made from beads (imported from China, previously from Europe), and a printed bandanna on her head (see Engaging the New). Similarly, a Bolivian woman may wear a bowler hat, as many gathered skirts as possible, sandals made from old automobile tires, a polyester sweater, vinyl handbag, and neon version of the carrying cloth used from time immemorial (fig. 4). Giant serving spoons, a Scottish kilt pin, or a large safety pin may replace the tupus or silver straight pins that held together Inka women’s shoulder mantles (see Capturing the Rainbow). Figure 4. Bolivian indigenous women sport a historical overlay of clothing from the Inka, the Spanish, and the global world of today. Photo by Norsk Folkehjelp Norwegian People's Aid, licensed under CC BY 2.0. Such continuities and discontinuities run parallel in all cultures at any given time: we may wear shoes shaped much like those of centuries ago, yet made of nylon and neon colors. Thus, there is no such thing as a static concept of one configuration being “traditional” and another not. Perhaps counter-intuitively, what is traditional, meaning more reflective of before than of now, changes continuously. For example, it was traditional to put little boys in pink clothing, patent leather shoes, and ruffled dresses in the 19th century (fig. 5) (Frassanito and Pettorini 2008). Now it is traditional to do the opposite. Thus, “traditional” is a moving target. However, if we use the term for “more linked to the past” and less changed, it remains a useful adjective. It is important to find terms for how things change and stay the same in situations in which one group of people (here the Spanish) take over others (the Guna, Maya, Aymara, Inka). These conditions are fraught with leftover imperialist, colonialist, primitivizing terminology and attitudes. One useful concept for when cultures collide and begin to mediate with one another is “syncretic,” meaning an amalgamation of different religions, cultures, or schools of thought (Shorter Oxford English Dictionary 2002, 3153). To merge, conflate, or somehow mediate between quite disparate elements lies at the core of syncretism. The situation in the indigenous Americas since European invasion and colonization typifies syncretism: shamanism blending with Catholicism (see Dressing the Saints), indigenous with foreign cultural expectations, almost diametrically opposite thought-ways attempting to coexist. Textiles, and dress in general, actually constitute one of the most revealing expressions of syncretism. Figure 5. 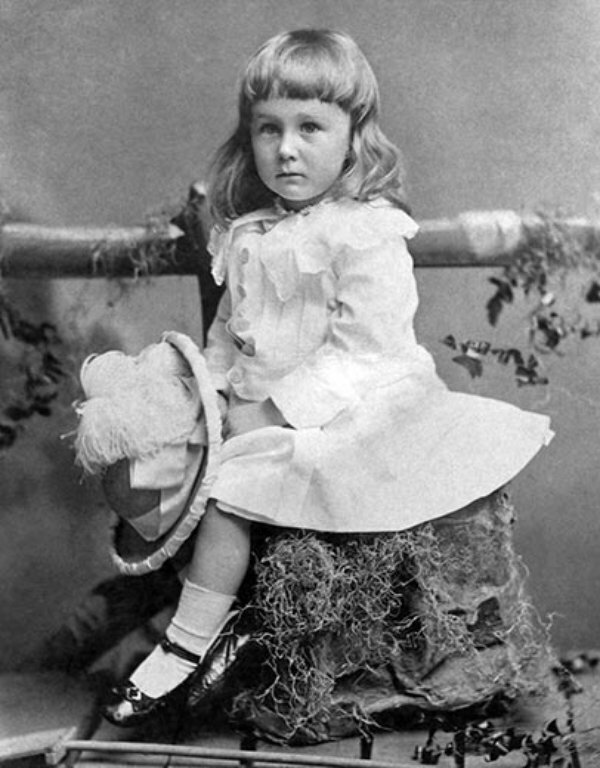 A photograph of Franklin Delano Roosevelt at age two, shows how boys were dressed in 1884, the way girls are nowadays. Unknown photographer, 1884, licensed under Public Domain. Centuries of indigenous weaving practices — tools, materials, techniques — are retained even as the women textile artists of Bolivia embrace new Spanish subjects, such as horses on a coca leaf bag, a form that began to be made thousands of years ago (fig. 6). In this 21st century bag silver coins are added to the fringe, representing wealth in Western terms as well as in ancient ones (for an example of silver plaques sewn to miniature boots (see Stone-Miller 1994, 134-135). In modern Andean examples, the new (Spanish introduced) riding animals gallop alongside llamas, one of the first domesticated creatures and still a pack animal (see Capturing the Rainbow). Guna women of Guna Yala, the north coast and associated islands of Panamá, were forced to adopt European-style blouses with gathered sleeves and yokes (see Engaging the New). Nonetheless they eagerly added scissors and machine-made cloth to their tradition of handweaving cotton to shape and size, and today overtly celebrate those novel items, now commonplace, in their blouse panels (fig. 7). As in the rest of the world, Maya women weavers have brightened their palette several times as new materials become available (fig. 8) However, they still value red and purple highly, as they did in earlier times, when they were made from cochineal and the ink of the sea snail (Plicopurpura pansa). A woman’s wedding outfit may combine lace, gathered sleeves and collar, and adopt the color white as in Europe, yet these new features appear alongside brocade and geometric patterns in horizontal stripes that have been part of traditional wedding attire for centuries. Figure 6. A man’s ch’uspa or coca bag today may feature horses – a Spanish introduction from the 16th century – and dangling European-related coins as decorations. Michael C. Carlos Museum, 2016.21.2. Photo by Michael McKelvey, 2017. “Finally, cloth is being recognized as fundamental to studies of gender, social identity, status, exchange, and modernization… Under the rubric of ‘aesthetic strategies’ [are] the diverse ways in which women invest meaning in textile arts. These arts eloquently express women’s concerns with tradition, transmutation, modernism and a host of other topics… [Textiles] compose a fragmented stratigraphy of influences: wool and wild cotton; acrylic and metallic yarns; indigo and aniline dyes; yard goods from a host of international sources as well as rickrack, ribbon, and lace; gauze and polyester; indigenous brocade and pallay [Bolivian pick-up patterning in complementary weaving technique] as well as embroidery and machine stitch… Improvisations and appropriations in women’s textiles are deliberate (and sometimes culturally subversive). 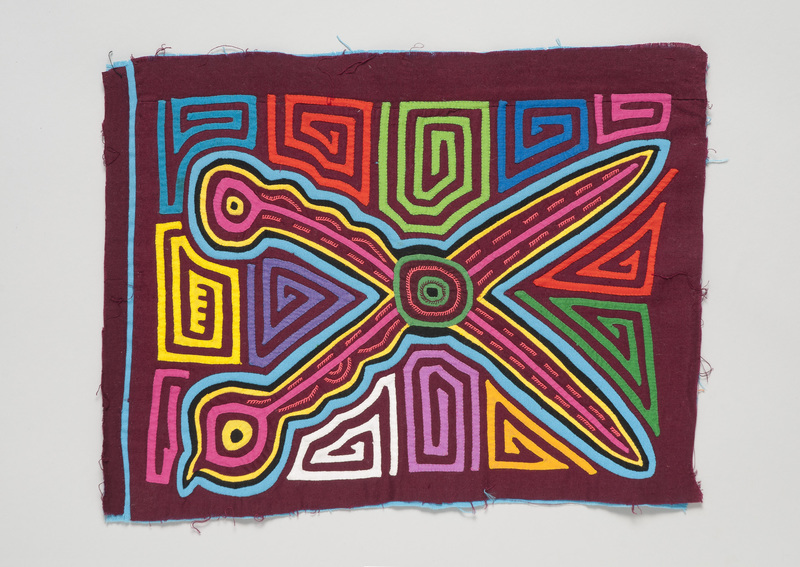 They are the essence of indigenous textile aesthetic” (1996, 437-439). 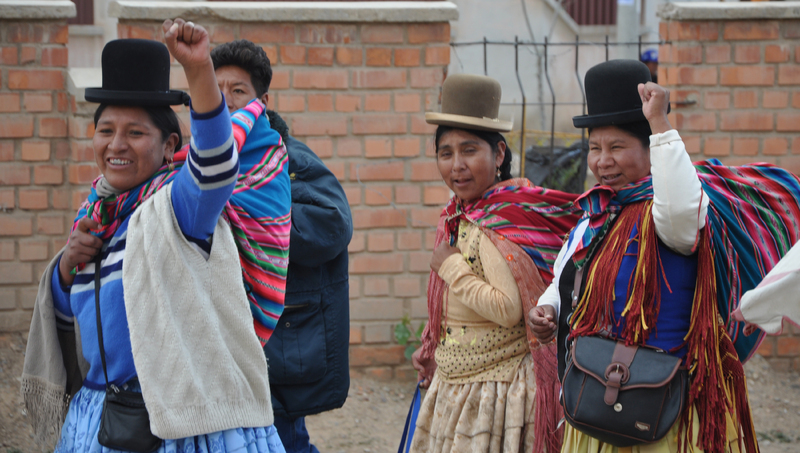 The stereotypical role of women staying closer to home — though Guna, Aymara, and Maya women are all in fact active merchants and entrepreneurs — and keeping to the old ways is balanced by their seemingly endless fascination with new input. Whether lace and printed polyester cloth, guitars and flowers, synthetic purple and red dye, or appliquéd rickrack, the changing world offers opportunities to embrace better (as in stronger, brighter colors) and different (as in the Trix™ cereal rabbit). Furthermore, what is chosen often falls within pre-existing values, such as finding the most vivid color palette available and depicting trickster figures, a modern example of which is the Trix™ Rabbit. Thus, the traditional structure of the equation can be recognized as well as how the change takes place in a substitution of the seemingly new into an ongoing paradigm. A horse joins a llama, both being big, furry, useful animals. Yet if used car tires make good sandals, they replace earlier, natural materials in a preexisting type of footwear. Figure 7. In a self-referential moment, this dulemola celebrates the scissors, brought by European missionaries, that make its creation possible. On loan to the Michael C. Carlos Museum, L2016.16.2. Photo by Michael McKelvey, 2017. This integration of new into old, this recombination with what is available, lies at the very heart of creativity, which can be minimally defined as novel combinations of existing elements. If one accepts this premise, then the weavers of the indigenous Americas, past, present and presumably future, are among the most creative artists of the world. When you add skilled crafting and design — the superior skills to sew, brocade, weave, finish, invent techniques, achieve high thread counts, dye intense natural colors, and generate exciting color palettes and pleasing designs — then surely these women textile artists rank high. The Andes in particular has seen the discovery of all known textile techniques over the millennia since the first baskets over 10,000 years ago; indeed, it holds the honor of having the longest and most compete textile tradition in world history (Stone-Miller 1994, 11). The indigenous American commitment to the fiber arts has been remarkable, as the other, in-depth essays in “Threads of Time” hopefully will reveal. Figure 8. A modern Maya wedding blouse combines European lace ruffles with the age-old rectangular shape and brightly colored brocade, now including synthetic fibers. Michael C. Carlos Museum, 2009.42.164. Photo by Bruce M. White, 2013. In this context, we offer “Threads of Time: Tradition and Change in Indigenous American Textiles” as a look at the dynamic interaction of old and new played out in thread. The flame is still very much alight.